Pine was born in Los Angeles. His father, Robert (born 1941), is an actor who co-starred on CHiPs as Sergeant Joseph Getraer, and his mother, Gwynne Gilford (born 1946), is a former actress who is now a practicing psychotherapist. He has an older sister, Katie. His maternal grandmother, Anne Gwynne (née Marguerite Gwynne Trice), was a Hollywood actress, and his maternal grandfather, Max M. Gilford (born Max Goldfarb), was an attorney who was elected president of the Hollywood Bar Association. Pine's maternal grandfather was from a Russian Jewish family, while Pine's other ancestry is English, Welsh, German, and French. Pine graduated from the University of California, Berkeley in 2002, with a bachelor's degree in English. He was an exchange student at the University of Leeds in England for one year. After graduating, he studied at the American Conservatory Theater in San Francisco. In 2004, he appeared in Why Germany?, a short film, and in The Princess Diaries 2: Royal Engagement. Pine played the part of Nicholas Devereaux, the love interest of Anne Hathaway's leading character. In 2005, Pine appeared in an episode of the series Six Feet Under, as well as in Confession, an independent film that was released directly to video, and The Bulls, another short film. Pine appeared in the made-for-television film Surrender, Dorothy which aired in early 2006. He played Jake Hardin in the American film Just My Luck, a romantic comedy in which he starred opposite Lindsay Lohan, who played Ashley Albright. The film was released on May 12, 2006. Later that year, Pine appeared in the comedy Blind Dating and in the action film Smokin' Aces. In 2007, he starred opposite Scott Wolf in the Los Angeles production of Neil LaBute's play Fat Pig, winning positive reviews for his depiction of a competitive, alpha-male friend. He portrayed real-life Napa Valley vintner Bo Barrett in the 2008 film Bottle Shock. 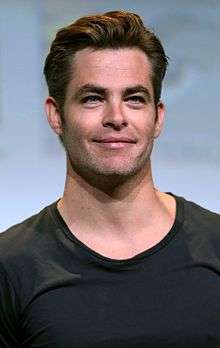 In 2007, Pine turned down a role in a film adaptation of White Jazz, to accept the part of James T. Kirk in the 2009 Star Trek film, which was released to critical and viewer acclaim in May of that year. That same month, he made a brief appearance promoting the film on Saturday Night Live, with co-stars Zachary Quinto and Leonard Nimoy. During the rest of summer 2009, he appeared in the Los Angeles production of the Beau Willimon play Farragut North. Pine was rumored to play the title role in the 2011 Green Lantern film, but the role eventually went to Ryan Reynolds. In the fall of 2009, Pine began filming the Tony Scott-directed and Mark Bomback-written action film Unstoppable, which was released in November 2010. In the film, he played a young train conductor who helped a veteran railroad engineer (Denzel Washington) stop an unmanned, half-mile-long runaway freight train carrying toxic liquids and poisonous gases from wiping out a nearby city. The Hollywood Reporter named Pine as one of the young male actors who are "pushing—or being pushed" into taking over Hollywood as the new "A-List". In 2011, Pine sat down with the original Captain Kirk, William Shatner, for the feature length documentary The Captains, which Shatner wrote and directed. The film sees Shatner interview Pine about his career and how it felt to take the role of Kirk for the 2009 movie. Their interview features a scene where the pair arm wrestles; pictures of this incident "went viral" leading to Internet headlines such as "Kirk v. Kirk" and others. Pine filmed the romantic comedy This Means War, with Reese Witherspoon and Tom Hardy, during the fall of 2010, in Vancouver. This Means War was released in February 2012. Pine portrayed the voice Jack Frost in Rise of the Guardians. Pine co-starred with Elizabeth Banks, Olivia Wilde and Michelle Pfeiffer in the family drama People Like Us, which was filmed in early 2011 and released in June 2012. He reprised the role of Captain Kirk in the sequel to 2009's Star Trek, Star Trek Into Darkness, released in the US on May 15, 2013. In 2014, Pine in talks to star in the Thriller about US Coast Guard, The Finest Hours,  released in January 2016. He guest-starred in Netflix's Wet Hot American Summer: First Day of Camp and lend his voice for SuperMansion in 2015. May 2015, Pine confirmed to play one of the Howard Brothers, along with Ben Foster in Hell or High Water (originally called Comancheria ), filming started on May 26 2015 in New Mexico, USA. The film premiered at the 69th annual Cannes Film Festival in May 2016, released in August 2016. He reprised the role of Captain Kirk in Star Trek Beyond, filming started June 2015 in Canada,  released in the US on July 22, 2016. Pine was invited by Barbra Streisand to duet with her on her album Encore: Movie Partners Sing Broadway, along with other stars. 2003 The Guardian Lonnie Grandy Episode: "Hazel Park"
2003 CSI: Miami Tommy Chandler Episode: "Extreme"
2014 Robot Chicken Captain Jake (voice) Episode: "Noidstrom Rack"
↑ "California Birth Index, 1905–1995". Ancestry.com. Center for Health Statistics, California Department of Health Services, Sacramento, California. Retrieved May 12, 2013. 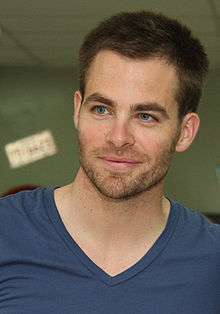 ↑ "Chris Pine biodata". Flixster. May 4, 2009. Retrieved July 19, 2010. ↑ Torre, Nestor (May 15, 2009). "Star Trek launches Chris Pine to stardom". Philippine Daily Inquirer. Retrieved July 19, 2010. ↑ Vejvoda, Jim (July 10, 2009). "Ryan Reynolds cast as Green Lantern". IGN. Retrieved July 12, 2009. ↑ Abramowitz, Rachel (October 23, 2007). "Gosling and Clooney drop projects". Los Angeles Times. Retrieved October 23, 2007. ↑ Claggett, Bruce (September 12, 2010). "Film starring Reese Witherspoon to be shot in Vancouver". NEWS1130. Retrieved September 20, 2010. ↑ Hepburn, Ned. (November 24, 2011) 'Star Trek' Sequel To Open May 17th, 2013 Archived November 27, 2011, at the Wayback Machine., Blackbookmag.com; retrieved June 24, 2012. ↑ "'Wet Hot American Summer': Chris Pine, Kristen Wiig, Jon Hamm & Jason Schwartzman Join Cast". Deadline. Jan 28, 2015. ↑ "Crackle Sets Premiere Dates For 'The Art Of More', 'Supermansion', 'Comedians In Cars…' – TCA". Deadline. Aug 5, 2015. ↑ "Complete list of 2016 Emmy nominations and winners". Los Angeles Times. 2016-09-18. Retrieved 2016-10-03.